There have been many great redemption stories played out through music. For K.C. 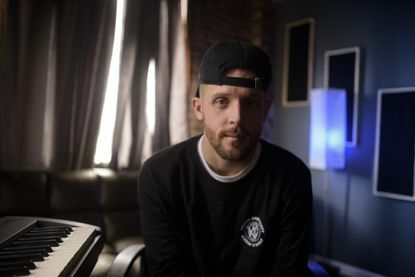 Conklin, also known as Connecticut rapper KC Makes Music, that story has been written through years of opiate addiction, culminating in a burgeoning music career that’s starting to see a window of opportunity open wide. KC Makes Music has never been shy about his struggles with addiction and depression. His debut album “Powerless” is peppered with lyrics about his daily struggles and the effect his battles have had on those around him. But it was on his single “Sober" that KC Makes Music and pianist/vocalist Jordan Meyer, who is a recovering alcoholic, decided to really open up about their struggles. The response has been one that neither of them could have imagined. With more than 16,000 views on YouTube for “Sober” in just under a month, KC and Meyer have clearly touched on a topic that hits home for too many people. While the true beauty of the track lies in its powerful message and its humbling delivery from two guys who have been there, the song itself relies on a powerful hook and a haunting melody. Like all of KC’s music, you don’t need to be a recovering addict, or have one in the family, to appreciate the track’s beauty. KC’s story is all too familiar to many people. Born into a musical family in Connecticut, KC moved to California at age 5 and relocated here at age 18. His early years were spent “hanging out with the wrong crowd” and having too many “Where’s the party at?” moments. He moved to Florida where his addiction started to get the best of him before he realized he needed help. After returning to Connecticut one final time, it was in the music of his youth that he finally found his calling. From a spare room in his family’s house, K.C. Conklin became KC Makes Music. He decided that YouTube and other online platforms were the perfect vehicle for his new passion – writing rap lyrics. The response he got from those early rap videos was encouraging enough to propel him to find a real studio to record in. He was put in touch with a kindred spirit in Meyer, also a producer who runs Jordan Meyer Productions in Windsor, and the rest is quickly becoming history. As the song and its content started to come together over several weeks of studio time, a decision was being made about the song’s purpose. Since the song’s release in January, “Sober” has not only shined a spotlight on the two talented Connecticut songwriters, but has helped generate important discussions surrounding addiction and all of its victims, including the loved ones most affected. KC says a number of professionals have reached out to share how they started to use the song in their work, including a motivational speaker based out of Wisconsin who shows the video before each session. His daily message for himself is one that he’s quick to share. You can listen to the track “Sober” by KC Makes Music and Jordan Meyer, as well as KC Makes Music’s new track “Shot In The Dark” on the streaming platforms of Amazon, iTunes, Spotify, Apple Music and Google Play. The videos for both tracks can be found on the KC Makes Music YouTube channel.